“Beautiful Swimmer that is savory” or Blue Crab names the olive, bluish-green crustacean with delicately white salty-sweet meat. 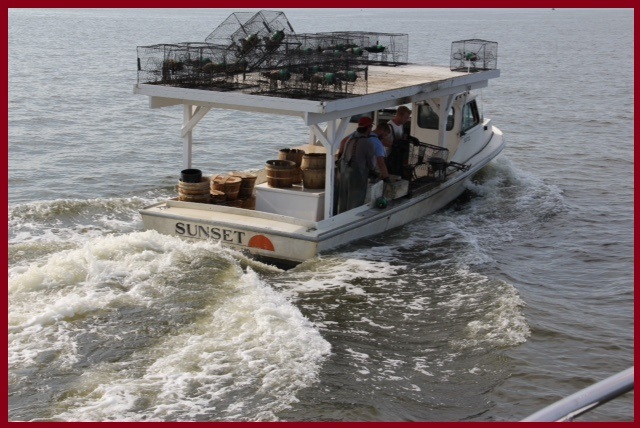 Crabbers set their pots strategically in Bay estuaries to capture crabs measuring upwards to 9-plus inches point to point. Through this process, both hard and soft shells find their appetites in pots bearing their cuisine of small fish, clams, snails, eelgrass, and sea lettuce. To harvest a true soft-shell crab, however, a 3-hour window exists from the moment a hard-shell molts and sheds its shell and a new one develops. The hard shells, however, receive quick grading between male and female and Bays, Jimmy to Jumbo sizes. Many enthusiasts enjoy the differences between Male and Female Crabs. The Male sports a unique inverted t-shaped abdomen while the female exhibits a rounded bell-shaped one along with striking bright red nail polished claws. Preference arises in the consistently flaky male crab meat compared to the female’s dense quality. We here at US Seafood and Meat proudly present all sizes and both male and female in dozen, ½ bushel or bushel quantities. Our crew seasons the crabs with JO spice #2 to customer requests: no, light, regular and extra spice. Follow us on Facebook for blogs and recipes for the Blue Crab! Special Note for Crab Enthusiasts: Our crew ships both live & steamed crabs depending on weather conditions. For instance, live crabs don't ship well during the winter months since they normally don't survive the transit. Please keep in mind the following chart for serving sizes. Get your hammers swinging, legs crack'n and meat dipp'n! Maryland Blue Crabs by the 1/2 Bushel Steamed with (5) Mallets, (5) Knives, and (5) Crab Bibs (1) lb Crab Spice. 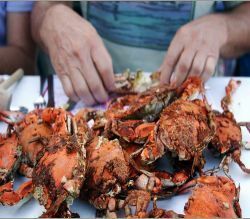 Maryland Blue Crabs by the Bushel Steamed (10) Mallets, (10) Knives, and (10) Crab Bibs (1) lb Crab Spice.